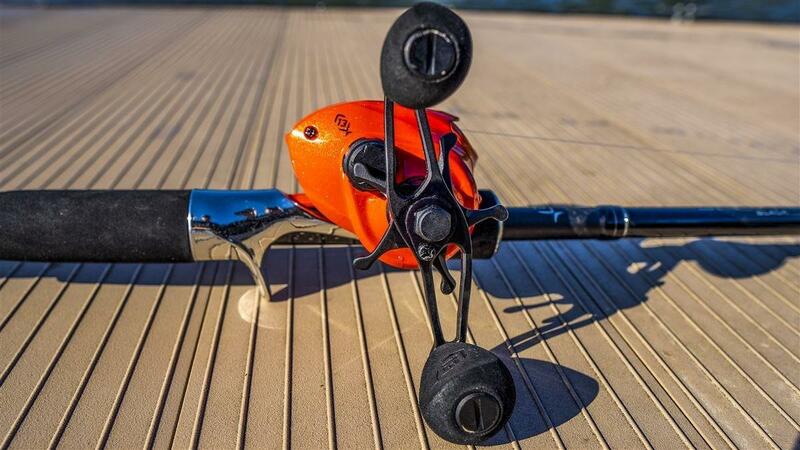 A lot of anglers have been asking me about the new "orange reel" from 13 Fishing called the Concept Z. 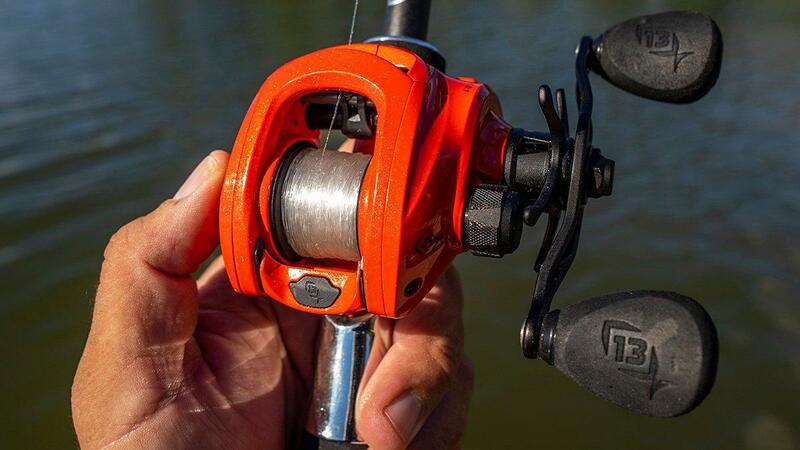 The Z is for Zero, as in the number of traditional ball bearings the reel boasts. But the reel is a lot more than a bright color and replacements for bearings. 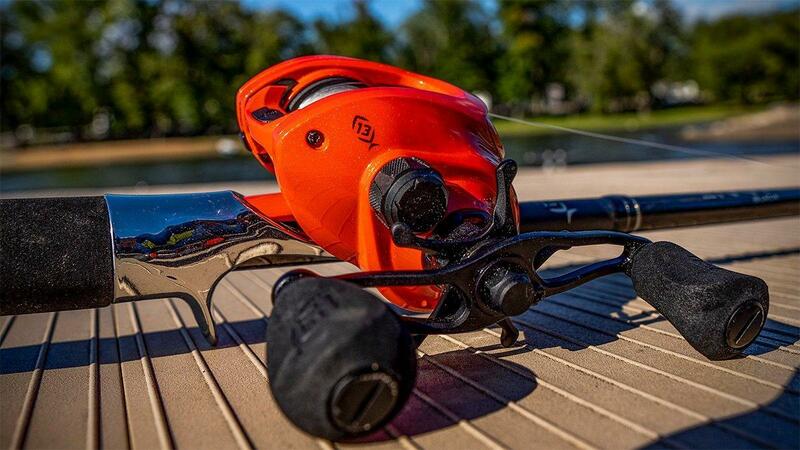 It was designed from the saltwater side where they were trying to solve the issues of needing a reel with beefy gearing and drag power to handle tremendous pressure and abuse while also withstanding more corrosive elements of saltwater. 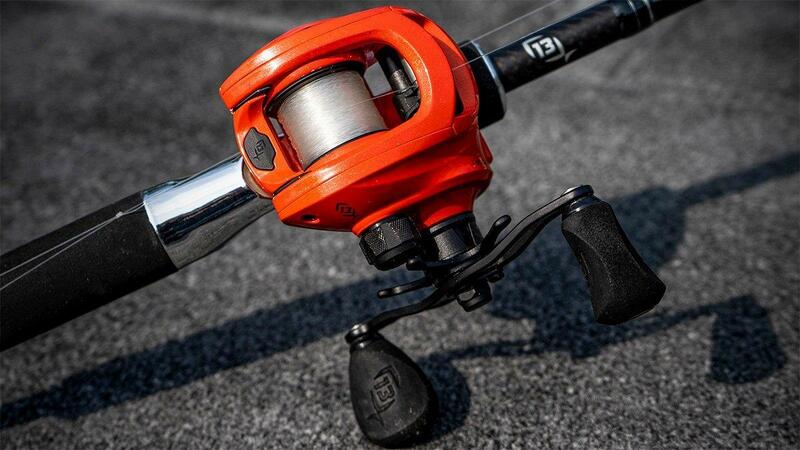 The result was a very long casting reel whose guts can handle a ton of abuse while still fishing like a compact low-profile bass fishing reel. The Concept Zero Bearing is a proprietary design with polymer technology that eliminates the issues with bearing corrosion and loss of fluid operation after months and years of use. Because the "bearing replacements" are polymer, you get a different sound on the cast and effortless operation on the retrieve. I was surprised how well the Concept Z can cast. 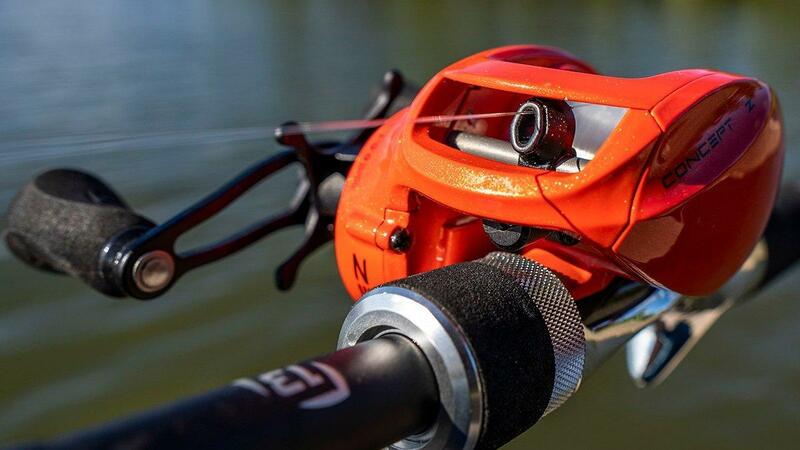 While maybe not outdistancing super tuned reels or a handful of bearing reels, the Concept Z definitely will throw even a light bait a tremendous distance. The reels also seem to operate just a hair better fishing in windy conditions in my experience. I've been able to throw light baits with relative ease even into the wind. The reel has composite side covers with an Ocean Armor 2 Protective process throughout the reel. What you get is a lightweight bait caster at just a hair over 6 ounces with a much greater resistance to dirt, debris and saltwater corrosion issues. I did have a little chip finally appear on the reel where I had hung a crankbait on the front edge of the reel while storing in my rod locker, so I don't advice hanging hooks on the frame of the reel as you may chip the reel doing that. But other than that, the reel still looks and feels brand new after more than 6 months of use. The tension knobs are tight and allow for micro adjustments as does the drag star. The drag is an impressive 22 pounds, which is a lot for such a lightweight, compact bait caster with composite sides. The Dead Stop anti-reverse rounds out the overall tightness and solid feel of the reel while casting and retrieving lures. I've found the casting to be very smooth with this reel. It does feel a bit different on the cast as is to be expected, but the line flows off the reel really well and is really quiet. I'm curious to see since they don't use ball bearings if you ever get whirring and whining on these reels. I have not seen that with mine so far. I've actually been most impressed by how quiet and smooth it is on the retrieve. While the casting is a bit different, so is the retrieve, only in a really good way. I feel like you could fish a 1/8 ounce lure on this reel and still be able to feel what it was doing without worrying with the reel overpowering a light bait like some baitcasters do. I've been really impressed with this reel for skipping applications. I've been using it to skip under docks with swimbaits and jigs. It handles really well. I thought the reel was really easy to get tuned and I honestly haven't messed with it much since first setting it up. I'm pretty impressed with the reel thus far for how well it has fished around shallow to precise targets. I think maybe part of that is because the reel feels so small in your hand and sits down so low on the rod. 13 Fishing uses their Arrowhead line guide in the Concept Z like most of their other reels. The reel casts really well at distance and especially well up close I have found. The line comes off the reel quietly and effortlessly and reels very smoothly. Honestly my only complaint about the reel so far is that I'm not really a fan of bright lavish colors like that on my rods and reels. But that's a personal preference things I suppose. The thumb bar has not had any issues with catching or not wanting to depress in certain handle positions. I sometimes worry about that with composite reels. The thumbar on the Concept Z works really well. I also appreciate all the small details in the reel. It has a large handle, solid EVA custom paddles, but it's really light because of how the handle is cut and swept. I've fished swimbaits, crankbaits, spinnerbaits, topwaters and even flipped a good bit with the reel. The Concept Z fishes like a really small, light finesse reel. But it has the features and guts of a bigger power reel. I like that combination of attributes for things like skipping swimbaits, Chatterbaits or jigs up under docks. It's the perfect reel for that. The way the Concept Z sits on a rod is very nice. Most of it's gear sits low to the side of the rod and the reel has a sleek pointed oval shape that sinks into a larger hand like mine. So you can put the rod and reel in your hand and fish all day with a lot less fatigue as you get hucking a big heavy reel all day. Overall I was impressed with the new concepts in the Concept Z. While I personally probably wouldn't trade my Concept C or Concept E for them, as I love both of those reels, I do think a guy that is looking for a durable reel that can cast a light bait really well, skip a bait really well and give you a lot of drag power with a big handle in a very compact, light profile will be very content with this reel. Mind the frame and keep hooks away from it and I think this will be a reel that will last guys a long time. It has become my go-to reel for skipping baits like I said, so I'm definitely happy with the one I have and have no complaints about its operation. I goofed up and chipped the paint by hanging a treble hook bait on the front of the frame now, but if you can avoid that I think you'll have a long lasting reel for casting small or big baits alike for a long time.